Christmas time is near and its all about seeing who’s been naughty or nice then bring on excellent fun team building to celebrate together. Make your work and office Christmas parties a day to remember for the right reasons this festive season. Kris Kringle gifting games, decorations on the native Aussie Xmas Tree. Making the office feel more like a home than work. Utilise great team bonding nurture vs nature experiences. Providing a fabulous team building experience. Here are Thrill’s best team building activities ideas list. For great Christmas office and corporate games to play hard. With the weather warming up, the days are beautiful to get outdoors and explore. Pubs, Cafes, Restaurants, Baristas, Beers, Coffee and extraordinary culture. Do anything fun for your team that works up an amazing appetite. Great race style competitions is the best bang for buck activity for your team. Working towards the final destination with celebratory drinks is a refreshing way to start the holidays. Jeff Probst is the master host of Survivor. However did you know that Thrill staff have hosted more tribal councils and Survivor activities than Jeff. Its true! This Christmas push Thrill over the line with incredibly fun Survivor immunity challenges. Collecting tree mail – no you don’t need to wear a bikini or just a buff. This is Australia and we have cultural differences and some decorum, perhaps. Ultimately you can elect 5-11 Survivor activities for your team to accomplish. The tribe with the most Jury bones. As well as the tactical skill of building relationships within their tribes. Will win the hand crafted Survivor Immunity Idol. Tune into our very own Survivor channel for the latest updates for tips and techniques on voting at tribal council. Today we had Nestle have a brilliant event on Cockatoo Island and Escaped to lunch and drinks at the bar as a reward for exceptional teamwork. Think combining the greatest Showman, Tom Gleeson and Grant Denyer going all out to play HARD with a Thrilling host, That holds the whole show together. Taking your team on a cracker of festive journey through the games mine-field. Do we love games? You bet we do. Even better when we have an audience up for the competition and ready to let their hair down and scream for more! Testing your mind cells, whilst activating the body and a refreshing drink. No mind over matter; it’s about playing for fun and the kudos of participation over the advent of just winning at all costs. Where humour is the greatest goal. Thrill has the greatest games Show. Experience the frivolity and be super humanly impressed of the secret talents and party tricks that your work colleagues and staff have been hiding up their sleeves all year. Christmas goes beyond the challenge of thinking of suitable presents for everyone; it’s about time we gifted and game more. Toy Factory and Toys-4-Kids is the team building activity that incorporates CSR elements. Teamwork, cooperation, following flat packing instructions and a bit of love brings out the best in us this festive season. Invest in the best chrissy pressies for staff celebrating together. Assembling toys and being santa’s best elves. This is the best fun style of team building that Thrill loves to host and facilitate each year. 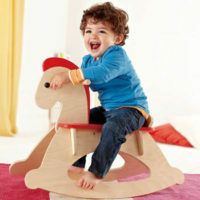 We work alongside your staff to craft the presents disadvantaged children dream of. No matter if your team has been naughty or nice. Reindeer redemption time is here and we command you to fill Santas sleigh with delights for the kids. Thrill’s mystery finding Santa fun treasure filled Christmas activity! A hidden mystery trail along the docksides, alleyways and historic pubs of Sydney may lead your team to a secret destination. Surprise its your work party destination with a real Santas treasure chest to unlock and open. 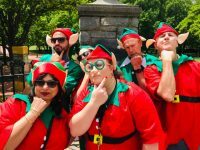 The clever fun clues are ideal for a corporate team conspiracy (piracy) for friendly pirates, elves and santas to get dressed up. Even more fun are the dancing reindeer team that Volleyball Australia entered last week. Best dressed this Xmas costumes exhibitionists so far! Oh what Fun it is to play Christmas Team Building with Thrill today. But, you better Hurray! Here it is! 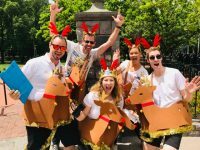 5 of the best Australian Christmas team building ideas that ensures the whole office work force is celebrating with cheers! Thrill Team Building is about the engagement and cooperation of businesses seeking professional event planning services. We don’t sleep until the elves, reindeer, santas helpers and gifts are all donated to Australian charities. Konrad Lippmann Thrill events director will match 1 children’s toy to be donated and gifted alongside your team building and bonding fun for every staff booked. Contact us to custom build your next corporate or business event, wrapping up 2018 with smiles.